Ain't Them Bodies Saints floats by with an eerie, remote timelessness, maybe occurring in the past, or maybe metaphorically stuck there. Ain't Them Bodies Saints never announces its time period. David Lowery's film begins with a title card explaining that it takes place in Texas, and the cars we see on screen, along with a lack of cell phones, place the story somewhere earlier than now, maybe the late '60s or early '70s. But the movie floats by with an eerie, remote timelessness, maybe occurring in the past, or maybe metaphorically stuck there. In this way, the film evokes Terrence Malick's universe. Its stylistic markers are everywhere, from the dusky cinematography and long shots of fields to voiceover tracks and outlaw lovers, Bob Muldoon (Casey Affleck) and Ruth Guthrie (Rooney Mara), who vaguely recall Kit and Holly, the Martin Sheen and Sissy Spacek characters from Badlands. Saints opens with Bob and Ruth in mid-spat; she threatens to leave, then tells him she's pregnant. The scene cuts to the couple together, happier, with Bob promising to take care of his new family. A few cuts later, they're in a shoot-out with the police. What separates Bob and Ruth from Kit and Holly is their approximate pragmatism. Bob steals for money rather than killing for fun, and when Ruth wings lawman Patrick Wheeler (Ben Foster), Bob decides they will surrender and he'll take full blame for the incident so that she and their unborn child can go free. When the movie jumps ahead some years, Bob is in prison, writing letters to Ruth every day, while she and her young daughter Sylvie (Kennadie and Jacklynn Smith) live together under the watchful eye of their neighbor Skerritt (Keith Carradine) as well as Wheeler, who has taken a liking to both mother and daughter. Foster may have the toughest job in the movie, as he submerges the dirt-bag menace that has become his character-actor stock in trade. Wheeler must show that he cares for Ruth and Sylvie without making creepy overtures or sacrificing his duty as a police officer, especially when Bob breaks out of prison (off-screen, after several attempts) in order to, everyone assumes, reunite with Ruth and the daughter he's never met. At this point, Saints becomes an inversion ofBadlands: in Malick's movie, the young lovers went on the run from everyone, destination nowhere, while in Lowery's, Ruth stays put as Bob races home. Lowery's film is also more internal than Malick's. As misguided and sometimes opaque as Bob may be, doesn't have Kit's trigger-happy psychosis, and Ruth has a clearer inner conflict than Holly. If Ruth doesn't express her lingering love for Bob, Mara yet gives the distinct impression that she may not be so unhappy in her new life, that her daughter may add meaning to her existence that Bob Muldoon couldn't on his own. To emphasize the mother-daughter closeness, Lowery uses slow push-ins on Ruth and Sylvie cuddled together, giving their scenes a touching, understated intimacy. Shots like this emphasize as well the intelligence of Bradford Young's cinematography, beyond its pleasing aesthetics, although it is also, at times, stunningly beautiful. His vision of Texas doesn't fall back on clichés of broad daylight over wide landscapes. Rather, many of Bob's scenes take place in or near darkness and many of Ruth's mornings and afternoons look faded and elegiac. Not a whole lot happens in many of these scenes, which may be why it's so tempting to compare Saints to Badlands, even as it stakes out its own territory. Ultimately, Ain't Them Bodies Saints is a movie about waiting: Bob waits for the right time to sneak back to Ruth; Ruth waits to sort out her conflicted feelings; the police wait for Bob to reveal himself. It's thematically unified, but sometimes verges on dullness. Lowery's filmmaking is more accessible than that of present-day Malick (To the Wonder), but it doesn't add the unexpected digressions of, say, David Gordon Green, who also carries a heavy Malick influence in movies like Prince Avalanche. 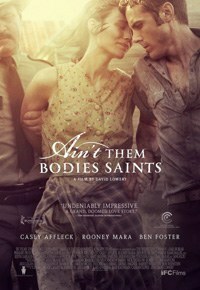 Ain't Them Bodies Saints looks gorgeous and feels emotionally real, but it's too studied too.